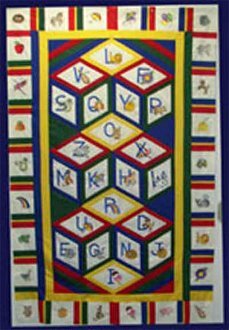 A wonderful quilt to adorn any childs wall, you can also use as a learning tool, by helping them find and name the animal and letters. Bright color border strips frame each of the blocks to add depth to this design. The wide border has square blocks with designs embroidered without the letter. Kaye's easy Y-seam technique is included with this pattern. Uses the View & Do Diamond Shape (sold separately).